Marvel’s first family are notoriously absent from their “All-New, All-Different” universe. Sue Storm and Reed Richards are gone. Johnny Storm works with the Inhumans, the Thing with the Guardians of the Galaxy. Even their former home is now owned by Spider-Man. But it turns out Peter Parker had a good reason for it. Spoilers ahead for The Amazing Spider-Man #3, by Dan Slott, Guiseppe Camuncoli, and Cam Smith. Inevitably, as most things do in superhero comics, this devolves into a dust up between the Human Torch and Spider-Man (including a pretty spectacular callback to the very first issue of Amazing Spider-Man from 1963, which saw Spider-Man sneak into the Baxter Building and fight the Fantastic Four). Johnny is seething that a close friend like Peter could tarnish the memory of the team—a team that Peter has frequently allied with and even served alongside for years—by taking over the home they had for years, but try as he might, Spider-Man can’t get through to Johnny why he’s actually done it. 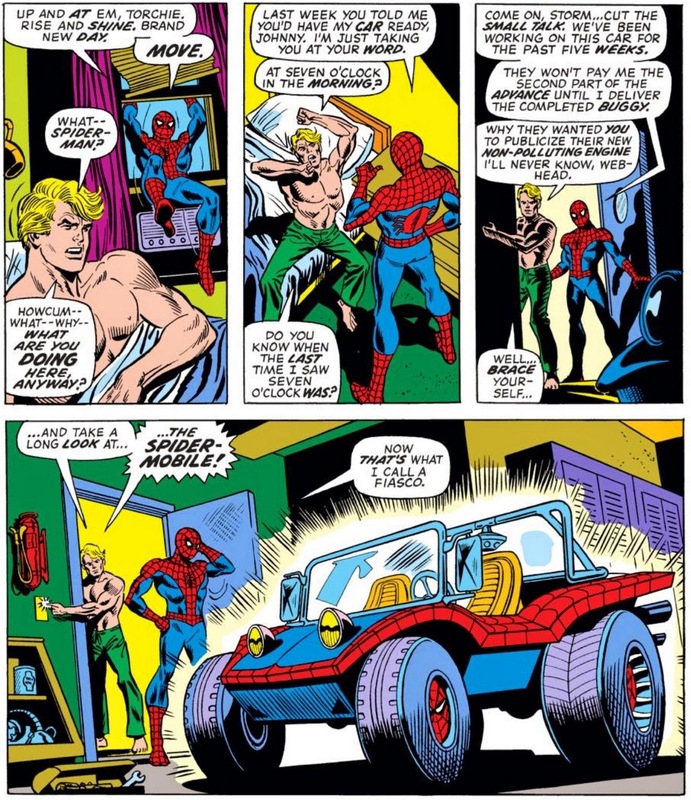 It also doesn’t help when Peter Parker, loveable wise-cracking jerk that he is, tries to calm down Johnny by showing him that his former bedroom is now an executive washroom, and Parker Industries built a new Spider-Mobile without Johnny’s input (Johnny helped make the first, disastrously-ill-advised Spider-Mobile all the way back in Amazing Spider-Man #127, in 1973). 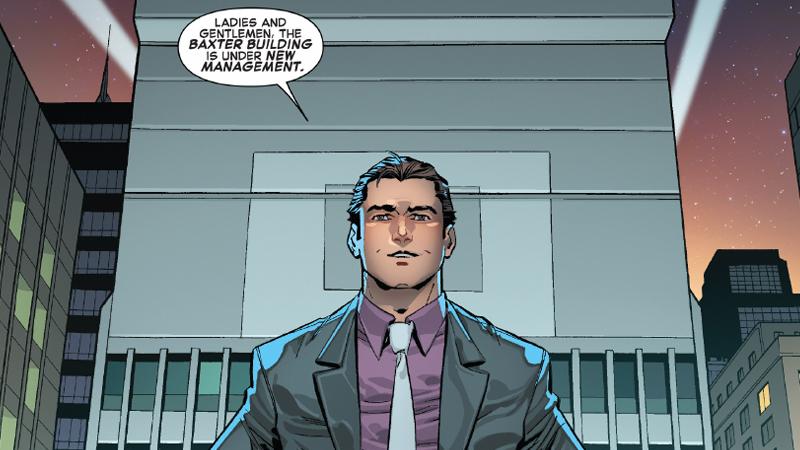 But fun and jokes aside, eventually Peter ditches his Spider-Man persona to show Johnny the real reason he took over the Baxter Building—and in the process, shows him a giant statue in the building’s foyer in honor of the Fantastic Four he had made when Parker Industries took over. Peter didn’t take it over just to annoy Johnny (and as the preceding dust-up showed, he’s already pretty damn great at doing just that), he did it to essentially sit on the Baxter Building until its owners can come and reclaim it. It’s a nice way to keep the legacy of the team going, even if they’re not actually around as a unit—as well as a promise that one day the team will make its way back to the Marvel universe. Let’s hope that’s sooner rather than later, and not forever afflicted by Marvel and Fox’s current spat over the Fantastic Four movie rights. The Baxter Building needs its rightful occupants again, if only to stop Peter from destroying half of his own property with superheroic smackdowns again.